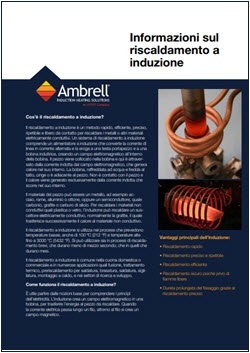 Le apparecchiature per riscaldo ad induzione della Ambrell sono particolarmente adatte per applicazioni di saldatura in linee di produzione. Il calore viene applicato ad aree specifiche di un giunto di saldatura, in modo molto controllato e preciso. La saldatura ad induzione è adatta per l’impiego in linee di produzione (ad es. per l’assemblaggio della fibra ottica nella ferrula) per via dei bassi tempi di raggiungimento della temperatura, degli alti livelli di ripetibilità, per la presenza di calore senza contatto e pulito. Given the small size of the part and the assembly's geometry, a graphite cylinder was required as a susceptor. Heating with induction required under 10 seconds and is a highly repeatable process; the customer can expect the same result every time with only the portion of the part requiring heating being heated. There is no open flame with induction, which makes it a safer method of heating than torch heating. The heating process was completed within 12 seconds, faster than the client's gas torch and more reliably. Without flame, induction helps create a safer, cooler working environment. High intensity heat must be applied to the joint area for this application so that thermal conduction of the copper does not sink away the heat delivered from the induction process. induction heating delivered a higher quality joint, is more energy efficient than the outdated system that the client was using. Current hand-soldering process results in uneven, non-uniform joints and requires long production times. Induction delivers uniform, quality joints by generating heat within the end-plate and reservoir walls. Customer is currently using a soldering iron & individually touching each soldering point which is producing inconsistent results and quality issues. To heat multiple joints on flex circuit strips to 180-200°F within seven seconds for a soldering application. 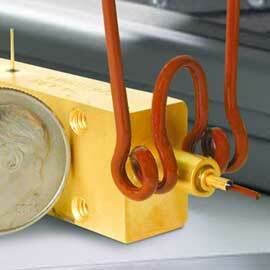 To heat a coaxial antenna assembly to 600°F within 2 seconds for a soldering application. The goal to improve on an existing procedure with a soldering iron which required 10 to 15 seconds. Heat multiple joints on solar flex circuit strips to 500°F (260°C) within ten seconds for a soldering application. Compared to using a manual soldering iron, induction heating precisely applies heat to for higher quality solder joints This is ideal for integrating with an automated system. By stick- feeding the solder more aesthetically pleasing parts are produced. A multi-turn helical coil is used and temperature-indicating paint is applied to the joint area. The wire assembly is placed over the induction heating coil, and RF power is applied. With an efficient coil design induction heating easily reaches the desired reflow temperature in a very short amount of time. Soldering two brass tubes measuring 3/4-inch and 1/4-inch together for use as cellular phone antennas. The lengths of tubes range from four (4) feet to twelve (12) feet, and must be soldered along the axial side. To heat a section of 3/8 inch copper tubing along with a 90 degree elbow for soldering. The copper tubing is to be used in Ice Machine Evaporator Assemblies, and soldering takes place after the tubes have been placed within the assembly. To heat a brass bellows and end cap assembly to 450F for soldering within 20 seconds. Presently, a soldering iron is used to produce the joint between the bellows and cap. La brasatura dolce ad induzione può migliorare il vostro processo di saldatura senza fiamma o elementi incandescenti. La brasatura dolce con riscaldo ad induzione concentra l'energia soltanto all’interno particolare. Potrete saldare i vostri materiali mediante un processo ripetibile, preciso e senza fiamma. Le macchine per la saldatura ad induzione presentano gamme di potenza in uscita da 1 a 20 kW, a seconda delle esigenze del particolare e del processo. Le apparecchiatura per saldatura ad induzione consentono di risolvere molti dei problemi di applicazione. La pulizia delle superfici dei giunti saldati è fondamentale. Entrambe le superfici metalliche che devono essere saldate devono raggiungere la temperatura allo stesso tempo. Se la temperatura è troppo alta, non è possibile creare un giunto resistente. Invece del saldante in stick, è possibile utilizzare una pasta o saldante preformato, che viene collocato nelle aree di giunzione prima del riscaldo.